Sea water does not freeze easily and thanks to the Gulf Stream, sea-ice is a rare sight in British waters. Just occasionally though, after a long period of bitter easterly winds, the creeks and rivers of the Thames Estuary begin to fill with ice. The winter of 1947 was one of the coldest on record, with night time temperatures in Essex as low as -20.6 C, and with snowfall somewhere in Britain every day between January 22nd and March 17th. 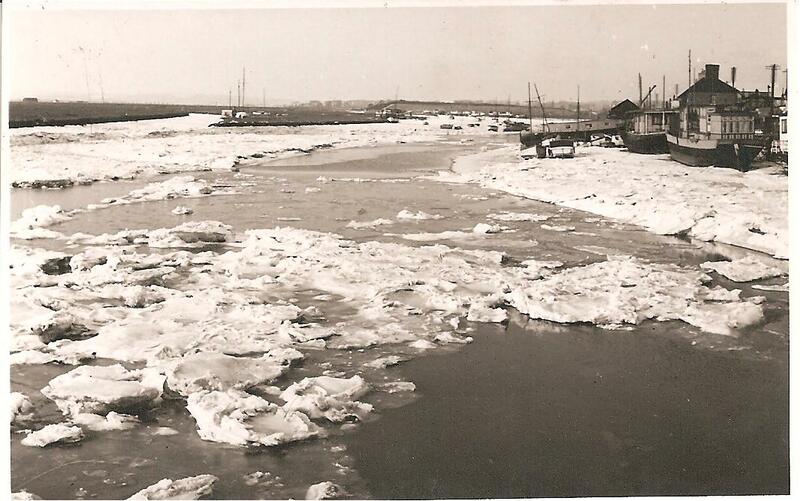 These pictures of ice floes in Benfleet Creek were taken from the old bridge to Canvey Island, or from its immediate vicinity. 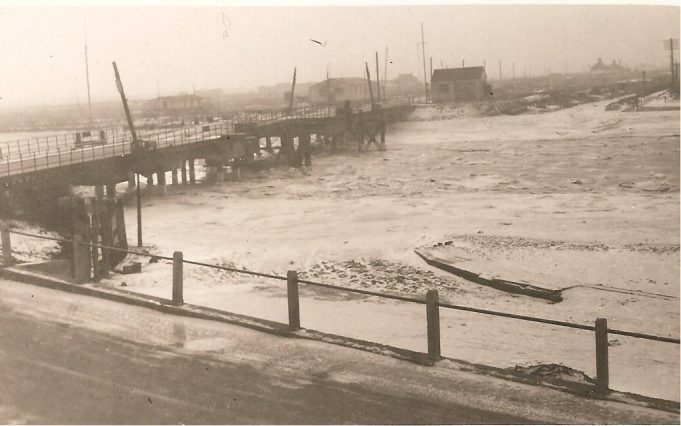 I have seen a photograph of ice surrounding the ferry to Canvey in 1929, and I remember similar conditions in January or February of 1963. I am not sure though whether the Creek has ever frozen since then, and in an era of climate change, one wonders if it ever will again. 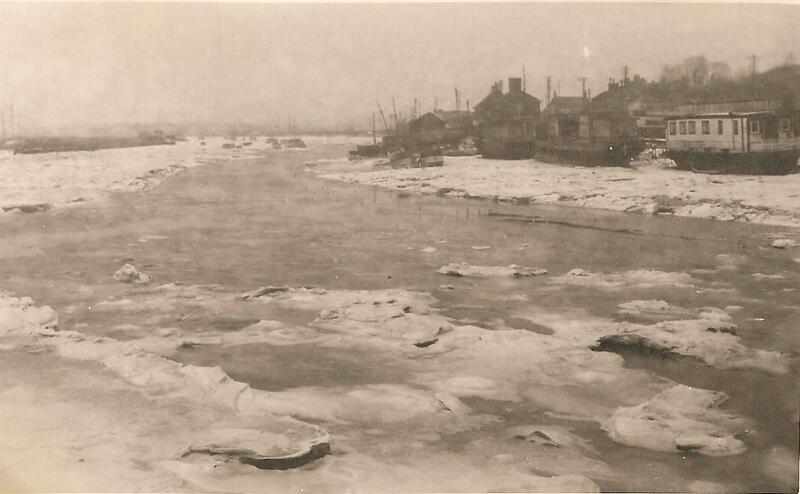 Ice on the north shore, looking eastwards. 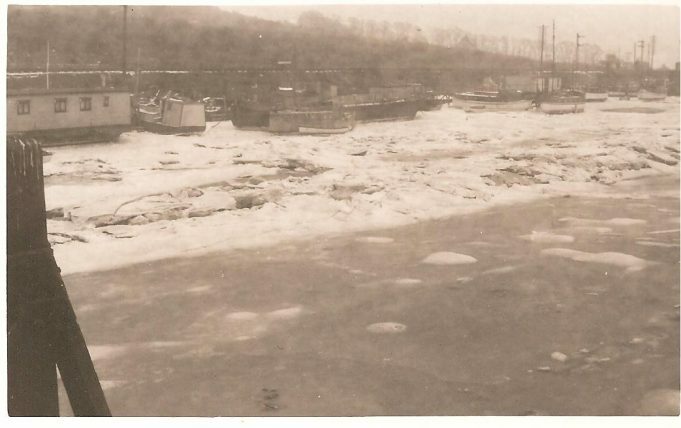 The old bridge itself, surrounded by ice. 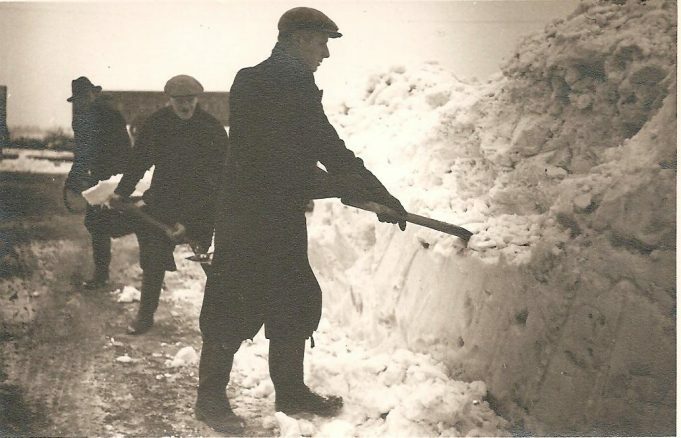 A group of unidentified men tackling the snowdrifts on shore. Are you the same Colin Mac whose mother ran the chemist shop (now demolished) which backed onto St. Mary’s graveyard on the right going down the hill towards the Hoy and Helmet? I can remember 1947 as being a bit on the nippy side as well, not long after the war of course, so things were still difficult to find or buy and as I recall coal not always available or in limited amounts. Ten hundredweights at a time, which I seem to recall being delivered into the indoor coal store from the side door. Further along Grove Road where we would go to visit Austin’s grandparents, were two ponds, one on the right going East and the second and larger one known to us as the Newt Pond, frozen almost solid and great fun to be able to run and stamp on as well as sliding about. No ice skates but wellie boots seemed to do quite well. Then back across the fields to Croft Road and stamping in every puddle in an attempt to break the ice, only sore feet though I’m afraid so after a while we had given that a miss. Even cold enough indoors to burst a pipe in the bathroom and having to get Mr Alec Street out to “wipe” the joint as he repaired it. Does anyone remember the 1963 freeze? I was “home from the sea” and at a loose end while pals were working, so I would get a job of some sorts to fill in time. During this time my friend Jack Hyde was building the slipway over the sea wall for the Prout brothers prior to the launching of their large catamarans. At the time I had a brand new Mini EWC 8 in surf blue and while waiting for the tide to go out we discussed just how thick and strong the sea ice might be and how much weight would it bear. The upshot of this conversation was that two nitwits got into the Mini and drove it over the ramp and out on to the ice, not being completely stupid we did keep the doors open just in case. I think it was quite a while before we realized just what we had done and how daft it was. I’ve often wondered since if we could have driven to Leigh on the ice from Canvey Point. Those were the two coldest winters I can recall, even after leaving the County to live in Hampshire I don’t recall any thing as cold as those two winters but I know from the weather reports that it can be grim. I imagine myself standing at the corner of Pier Hill by what was Goings seafood shop and being cut in half by the “lazy wind” that roared up the hill too lazy to go round you but through you instead. Still hoping someone will know the whereabouts of the Bray family, any help anyone?